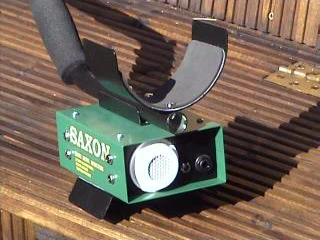 The Saxon SM45 is a modern easy to use detector operating on the Motion principle. It is similar to the SM35 with some added features for the more advanced user. The SM45 is similar to the SM35 but has several added features that will be helpful to the more experienced user. The inclusion of a gain control on the SM45 allows the sensitivity to be set a bit higher than the SM35. When searching difficult areas such as high mineralized soil or salt wet beaches the gain can be reduced a bit to avoid chattering or false signals. An all-metal pinpoint switch is also included on the SM45. 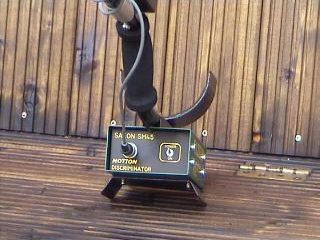 As the M in the name implies, the SM45 is a motion detector which means that it can discriminate and cancel out ground mineralisation at the same time. 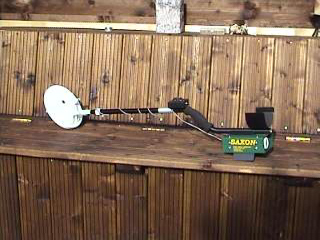 To do this the search head must be kept moving in order to register a target; the sweep speed, however, can be quite slow. The detector also runs on 'silent search'. This means that tuning is taken care of electronically, and the only sound normally to come from the headphones will be when the detector locates a metal object in the ground. 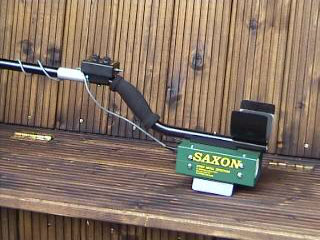 The Saxon SM45 is of the modern, 'cranked stem' design, now favored by most manufacturers and detector users. The handgrip is of molded foam rubber, and the upper stem terminates in a built in arm rest. The stem itself breaks down into three parts. This allows easy transportation to and from sites. It also means that the SM45 will fit into a small bag or suitcase should you be thinking of taking it abroad on holiday. Stem adjustment is by means of an aluminium locking collar, and is infinitely variable. With its green and black color scheme, the SM45 has a very 'workman like' look to it, that is actually carried through in its construction. 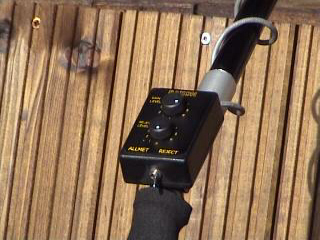 Robust but lightweight aluminium has been used (for control box, armrest, and shaft), rather than the usual cheap plastics, and the detector has been designed to take all the hard knocks that come with field usage. The battery compartment of the SM45 is situated at the bottom of the control box and separated from the rest of the electronics (to prevent damage in case of battery leakage). Access is by means of a metal plate/stand held in position by two coin slot headed screws. The circuitry is powered by a multiclip of eight AA penlight batteries (12 volts) and battery life is excellent. This battery pack is connected to a small socket situated at the rear of the detector to facilitate on board charging. A small charger unit is available as an extra at £16.50. Rear view of control box showing Speaker, Headphone socket, and Charger socket.